When it comes to establishing a benchmark statement for customer satisfaction, Walt Disney’s popular quote resonates well. “Do what you do so well that they will want to see it again and bring their friends”. Consistent feedback and working beyond the realms of this feedback marks success for every business venture. It holds significance for an organization’s commercial success and performance in the economic sphere. Customer Relationship Management (CRM) is fundamentally defined as an approach that helps enterprises to manage and communicate effectively with their current as well as prospective customers. Key functions of a CRM tool are developing and sustaining relationships with customers through marketing initiatives, managing customer communication and relationships as they mature through various stages. A CRM tool can empower a business across 3 areas, namely, Sales automation, Marketing automation, and Service automation. The underlying objective of implementing a CRM tool has defined its current popularity across industry domains. The latest enterprise software forecast from Gartner estimates that the global CRM market will reach $36.5B by 2017. This is a weighty increase from the $20.6B forecasted in Q1 of 2016. Moreover, CRM also leads all enterprise software categories in projected growth, showing a 15.1% CAGR from 2012 to 2017. Amongst the leading names in the CRM vendors market – SAP, Salesforce, Oracle, and Microsoft, Salesforce is leading the bandwagon. According to one of the Gartner reports, Salesforce dominates the worldwide CRM market with 18.6% market share, and 28.2% revenue growth from 2013 to 2014. Salesforce entered the CRM solutions market much later than the other leading names. It segments its products under a range of cloud-based products/services comprising Sales Cloud, Service Cloud, Marketing Cloud, Community Cloud, and Analytics Cloud. These offerings / solutions can be customized to best fit your business requirements. The reasons for its popularity could be multiple, however, some highlights are – Ease of implementation, Scalability, or Flexibility. 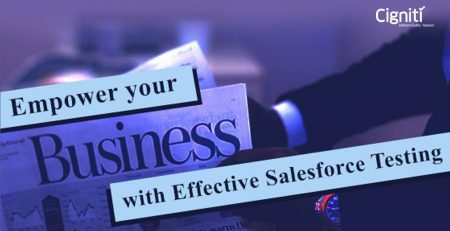 The industry mainly endorses the Salesforce.com platform for boosting productivity by managing the contacts, opportunities, leads, and partners. Nevertheless, there are tremendous challenges that one can encounter while Salesforce implementation and integration takes place within the dynamics of an organization’s ecosystem. The process of Salesforce implementation begins by defining the business objective and understanding the underlying purpose of implementing a CRM solution. It is important to take all the concerned stakeholders into confidence. This will boost the acceptance levels and help meet the desired goals. Acceptance amongst stakeholders is the initial & fundamental step to avoid any failure in Salesforce implementation. Salesforce (CRM) Testing entails Functional testing, Unit Testing, Manual Testing, Automated Testing, Deployment testing, and Security Testing. Nevertheless, an ideal implementation partner may recommend Sandbox testing, User Acceptance Testing (UAT), UAT Support, and Production Testing as well. We can speak at length about the various testing types, however, it is important to adopt a Test strategy and fit in your testing needs accordingly. The key aspects to consider during testing is functionality, performance, security, and scalability. Before the implementation / deployment process starts, experts advise to focus on Data cleansing to get rid of unwanted and duplicate data. During the Sales & Marketing cycle, loads of redundant data gets generated. For instance, customer data that doesn’t anymore qualify as a Lead could be part of the database for years. Creating a Data Map that connects every data field can work wonders for an organization! With this prelude, let’s further discuss the various strategic approaches that an experienced Testing partner would take for successful implementation. These would be the best practices an experienced partner would bring to the table. It is imperative to align various Salesforce CRM features with the business objectives. Understanding the underlying purpose of implementation is crucial. For instance, are you getting a CRM tool in place to automate your Sales or enable you in executing Marketing Campaigns? This will help you devise a rational and fitting strategy. It is recommended to consider the latest features on the Salesforce platform and align it with your organization’s business objectives and requirements. The concerned teams must ensure that every functionality introduced must add value for the business and eventually boost ROI. Pre-release trial is a special program that enables you to test your application on Salesforce before it goes into production. It is a testing platform that can be leveraged to try new features. This would not be linked to your production system, so the data in the LIVE environment would not be available. However, this could be an effective approach to test your various Salesforce applications in a test environment. 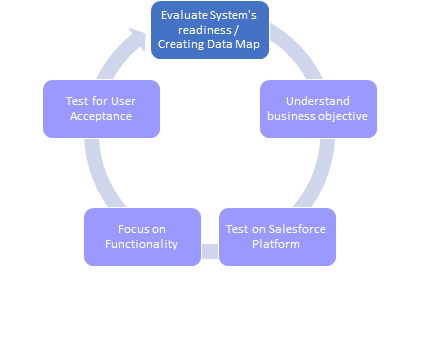 Salesforce testing must ensure excellence in the functionality of various applications. So, testing from a user’s perspective is very much required. Additionally, this ensures maximum test coverage and enhances overall code quality. User Acceptance Testing holds utmost relevance, as the most minute issues / defects can be fixed when it is reviewed and operated by the end users. As thorough testing by the user would certify a final sign-off for the project. Reporting the tests is the most logical practice that one must consider. The testing framework has to incorporate templates to report tests that business and Salesforce administrators can consider to address risks, defect, and test results from time to time. Every software / tool enhancement in your business ecosystem has to bring value and higher ROI. This is possible with a robust Test framework. Salesforce implementation if done successfully can bring business transformation and translate into commercial success. In essence, it is important to test it methodically, which can be done by collaborating with a partner who has extensive experience in Salesforce implementation and testing. Cigniti brings extensive experience and expertise in Salesforce Testing. Connect with Cigniti experts to leverage the experience of its Salesforce Test Architects, IP-led Hybrid Testing Frameworks and speed up your Salesforce implementation without compromising on quality. 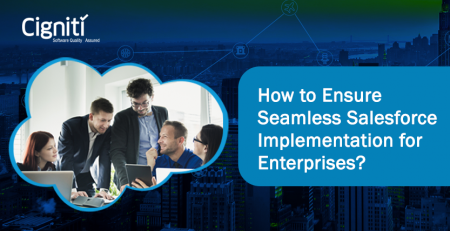 How to Ensure Seamless Salesforce Implementation for Enterprises?